A new study has shown that LED lights in deli cases can leave hamburger meat looking fresher -- and with more red color -- longer than than their incandescent counterparts. Photo by Wiktory via iStock. Nutritionally, nothing is different when red meat, say ground beef for instance, darkens to brown, but try telling that to the average customer at a grocery store. “That’s the number one driver that consumers have,” said Carol Lorenzen about the bright redness quality of meat. 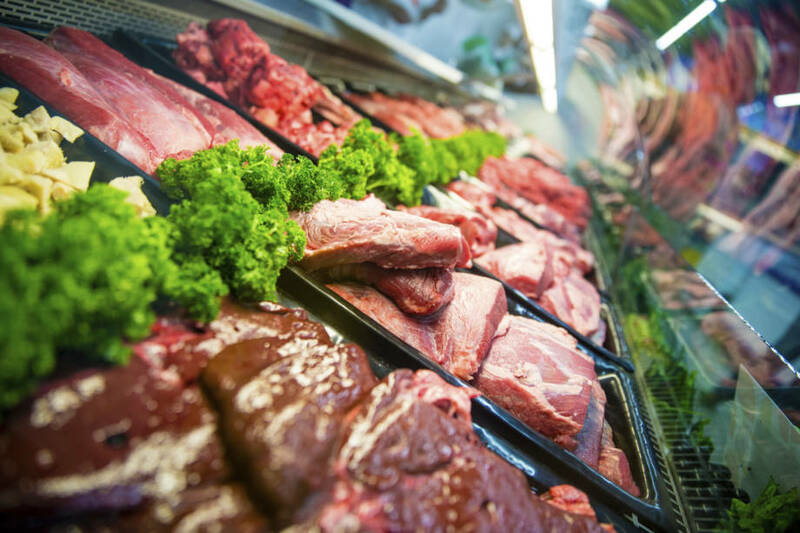 New research with LED lighting could prove big dividends for both meat retailers and consumers. Photo by andresimging via iStock. A research team involving that included Lorenzen, professor of meat science in the Division of Animal Sciences, and her graduate student, Jade Cooper, have been investigating the impact of LED (light-emitting diode) lighting on beef color. The team published a research paper in the October 2016 issue of the Journal of Animal Science that focused on how meat vendors can slow down teh redness-discoloration process in hamburger meat when it is kept under LED bulbs. For comparison, meat samples were also kept under the industry standard incandescent bulbs, which emit more heat than LED bulbs — and in no light as a negative control. At the moment, according to the Department of Energy, only five percent of the lights in the U.S. are LEDs, but that number is expected to balloon to 85 percent by 2035. This should result in a 75 percent decrease in energy consumption. 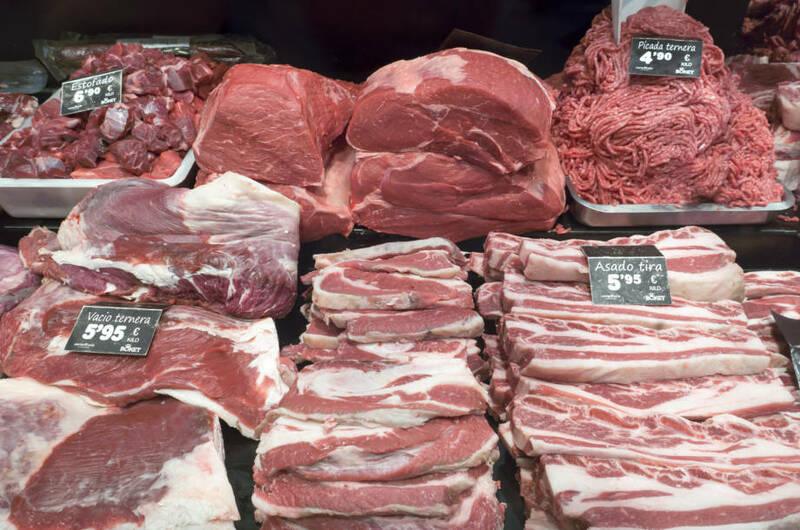 “It’s really imperative for grocers that we investigate different lighting technologies from an energy-saving standpoint and a meat quality standpoint,” Cooper said. The team also included Bryon Wiegand, professor of meat science; Leon Schumacher, program chair of agricultural systems management program, and Ingolf Gruen, program chair of food science — all from the College of Agriculture, Food and Natural Resources. In addition to looking at the color of ground beef patties at both five and 25 percent fat at intervals of one, three, five and seven days, the team analyzed the patties for concentrations of myoglobin (the protein responsible for the meat’s color) and lipid oxidation (a major cause of quality deterioration that can lead to the development of rancidity or off-flavor in raw or fatty tissues). The deli cases, which were purchased by Mexico, Missouri-based True Manufacturing using funds from Mizzou Advantage, were kept at temperatures near two degrees Celsius (35.6 Fahrenheit) during the experiment, which was funded by a grant through the Missouri Beef Industry Council. 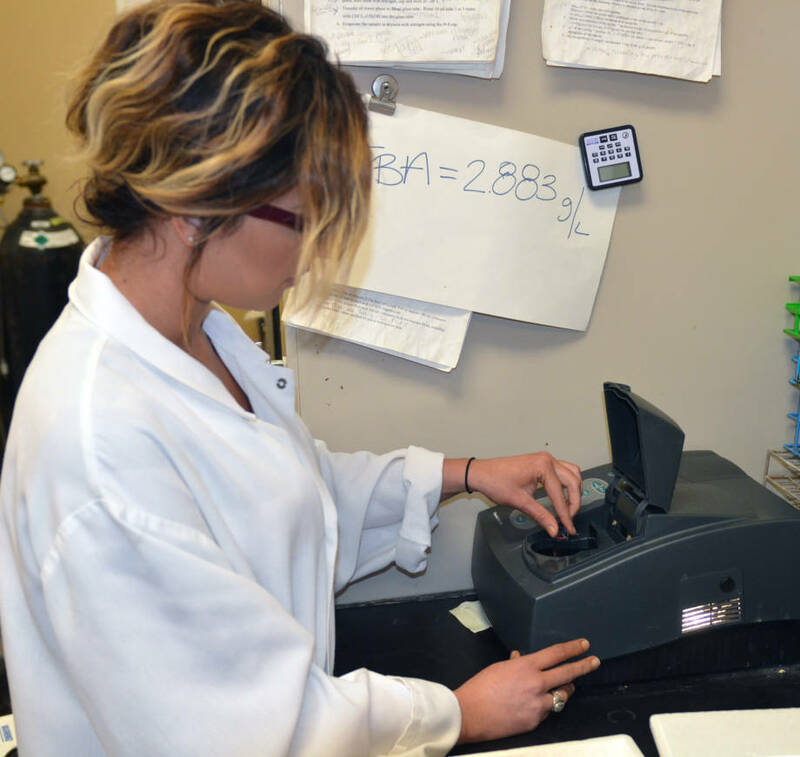 Jade Cooper uses a spectrophotometer to analyze samples of red meat. Photo by Stephen Schmidt. In all three conditions, more discoloration occurred the longer the samples were left in the display cases. At the fifth day, the LED patties had maintained a noticeable amount of red color compared to those under fluorescent lights. Those patties also had less oxidation of color and fat, adding to the extra display shelf life. As expected, it should be noted that the best results were achieved with no lighting — even though a retailer does not have the option to present it to the customer that way. “If we could we would do it, but people want to see the meat,” Lorenzen said. Furthermore, also as expected, the patties with 25 percent fat were considerably less red than their five-percent-fat counterparts, regardless of the lighting. Lorenzen said that most ground beef is generally off of the shelf at a grocery store or deli within a day given supply and demand. Still, the results with LED lighting has led to further discussion —and experimentation. With additional funding from the Missouri Beef Industry Council, Lorenzen and Cooper recently completed the research and analysis of a test using the same display cases on a whole muscle beef project — in other words, steaks — in which a high-oxidation muscle (a round in this instance) and a low oxidation muscle (out of chuck) were used. They were chosen because of certain biochemical properties that lead to different color stabilities. Although the final report on the test is still being written, the chuck steak, which had lower color stability, under novel lighting conditions turned brown at different rates depending on light bulb source where the round steak, which had a higher color stability, did not. LED lighting could have significant effects on delaying the browning of red meat. After conducting … Expand ▸LED lighting could have significant effects on delaying the browning of red meat. After conducting tests on hamburger patties, a research team at CAFNR has recently finished its analysis of whole beef muscles. Photo by venakr via iStock. Based on the results of both tests, Lorenzen and Cooper say that the use of LED lighting has the greatest application in areas that are closer to the bulbs, such as a deli case or full-service case. Still, they stress that more research is needed before any definitive suggestion can be made to those in the deli and grocery industries in regards to LED lighting. “We’re still working on data to make a recommendation like that, even though the data are very promising,” Lorenzen said. The root of the experiments stems back to 2013 when Schumacher and Lorenzen determined that they would try to do research on hamburger patties given that the meat already has a higher degree of fat in it, which is more likely to have oxidation than steaks. “The meat itself is already exposed to oxygen. This helps facilitate the browning that occurs on the meat,” Schumacher said. After obtaining initial funding through a faculty development grant from the Mizzou Alumni Association, Lorenzen started on a seed project after bringing brought in Cooper, an Oklahoma State University student who was on the MU campus as a research intern in Lorenzen’s laboratory through the Miller Summer internship program in the summer of 2014. 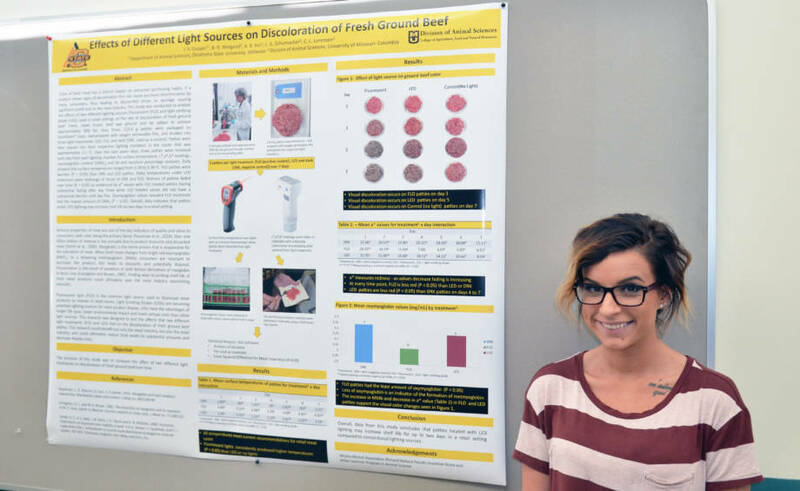 Jade Cooper stands next to the poster about the initial research on light sources affecting the … Expand ▸Jade Cooper stands next to the poster about the initial research on light sources affecting the color of ground beef done back in the summer of 2014. Photo by Stephen Schmidt. The seed project consisted of the hamburger patties in a large cooler with a ballast hanging (with Schumacher’s help) and the entire compartment wrapped in dark cloth, so that the light would not bleed into different areas. Cooper, who went on to become a graduate student in animal sciences in the spring of 2015, went on to present the results to a graduate forum and later the Midwest Section of the American Society of Animal Science. Cooper plans to finish her master’s degree this May before pursuing another master’s degree in public health. She hopes to one day work in the government sector in regards to food safety and security.